Iron tablets, also known as iron supplements, are a number of iron formulations that are used for a variety of reasons in a multitude of settings. It has been used medically since at least 1681, with its easy-to-use formulation being created in 1832. It is on the World Health Organization's List of Essential Medicines, the most effective and safe medicines needed in a health system. Its proposed use may range from correction of anemia in suspected iron deficiency to prophylactic use in pregnancy. It remains undisputed that iron tablets are one of the most widely used and prescribed drugs in the world, more so in the developing world. The fact that it is an over-the-counter drug only adds to its easy availability. The drug however is not without its side effects. The side effects being dose dependent, increasing amounts may precipitate increased incidences of morbidity or mortality. Studies demonstrate GI toxicity after ingestion of more than 20 mg/kg of iron, while moderate toxicity occurs at 40 mg/kg and doses above 60 mg/kg may be lethal. Ingested iron may have a corrosive effect on the GI mucosa, which may manifest as nausea, vomiting, abdominal pain, hematemesis, and diarrhea, and patients may become hypovolemic due to significant fluid and blood loss. The initial presentation is a necrotizing hemorrhagic inflammatory reaction due to the corrosive effects. The severity appears to be directly related to the duration of mucosal contact. Small bowel with localized collection of iron tablets leads to infarction and thus is a potential site of perforation. It must be noted that as the absorption of iron takes place in the duodenum, the chances of infarction and perforation, if any, would be concentrated in these regions, and it is very rare to find a defect beyond this region. Perforation of the ileum due to overconsumption of iron tablets is extremely rare and, to this author's knowledge, there have only been three cases ever reported. Here, we would like to present the case of a 16-year-old girl who presented with an ileal perforation following acute ingestion of iron tablets. A 16 year old female presented to our hospital on June 2017 with a history of ingestion of more than thirty iron tablets 4 days prior. She presented to the emergency room with a history of abdominal pain for 1 day and vomiting and abdominal distension for 1 day. The patient had no complaints of fever or altered bowel habits. On examination, she was found to have a distended abdomen with guarding and rigidity. After initial resuscitation, a computed tomography (CT) scan was done [Figure 1] that suggested perforated peritonitis with a rent in the mid-ileum, communicating with a loculated collection with a small bowel intestinal obstruction. After optimization, which included inotropes, fluids, and antibiotics, she was taken up to the operating room for a laparotomy and resection of gangrenous bowel and subsequent ileostomy on the same day. Under general anesthesia, the patient was placed in supine position and parts were painted and draped. A midline laparotomy incision was chosen. Intraabdominally, 750 ml of feculent fluid was drained. Flakes were found all over the intestine and a walled off collection in the Pouch of Douglas was found. An edematous small bowel wall was found throughout. A segment of the ileum, 5–8 cm from the ileo-cecal junction, was found to be incarcerated, which was resected and a double-barrel ileostomy was done as shown in [Figure 2] and [Figure 3]. After a thorough wash and placement of two abdominal drains, the abdomen was closed in layers. The two resected segments of ileum were sent for histopathology. It was grossly found to be gangrenous, measuring 3.5 and 3 cm in length, respectively. The serosas of both were covered with whitish flaky exudates. 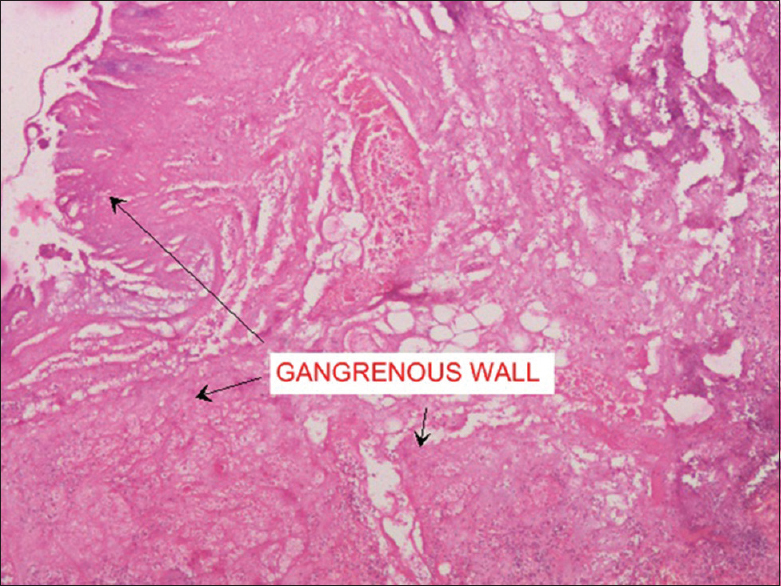 On c)	On cutting, the wall appeared to be nonviable with mucosa covered with exudates. Microscopically, the sections showed ileal wall exhibiting transmural infarction with transmural infl ammation. 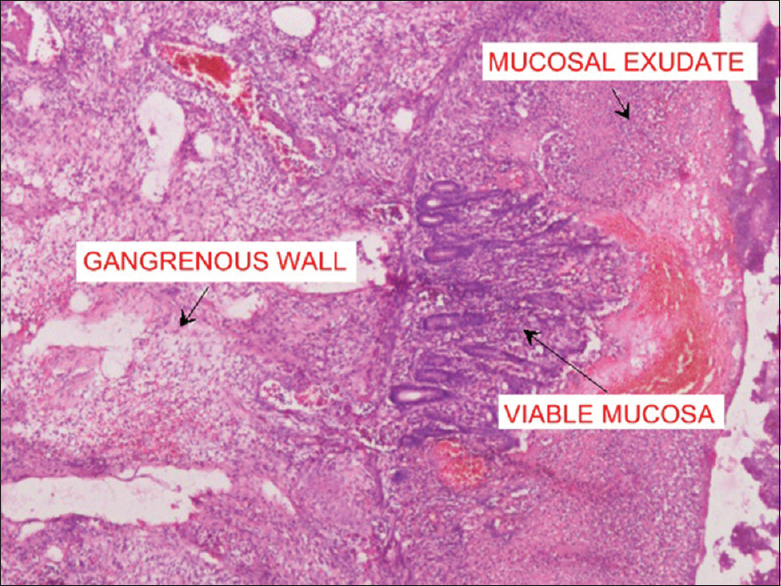 Focal areas of viable wall were noted, where mucosa showed superfi cial mucosal necrosis, which is covered with necrosis membrane as shown in [Figure 4], [Figure 5] and [Figure 6]. 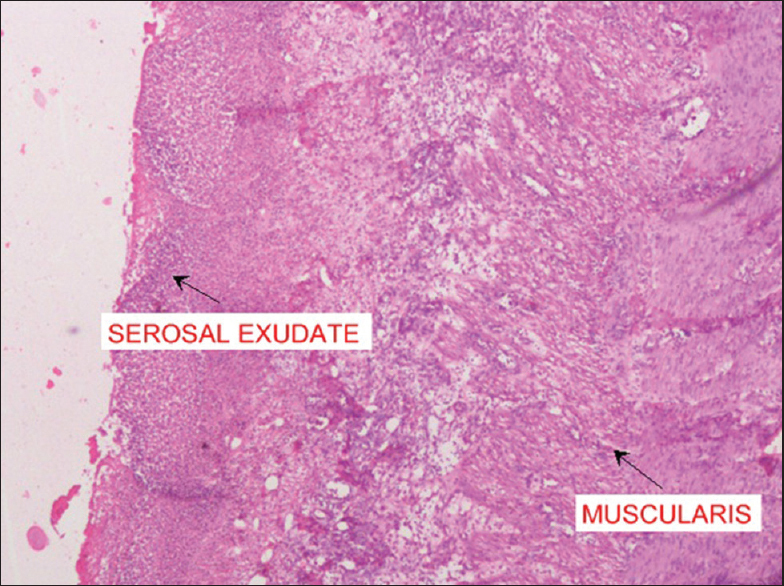 The serosa was patchily covered with acute inflammatory exudates. Final impression was of a gangrenous ileum showing features of perforation and acute peritonitis. Postoperatively, the patient was shifted to the Intensive Care Unit for closed monitoring. She was managed with antibiotics, analgesics, intravenous (IV) fluids, and other supportive measures. IV albumin was initiated in view of hypoalbuminemia, and potassium correction for an episode of hypokalemia was started. She was started orally on postoperative day 3 and stepped up. She presented with an episode of tachypnea that led to a pulmonologist consult, diagnosis of pleural effusion, and subsequent drainage of the pleural fluid under image guidance twice. Persistent fever spikes and tachypnea prompted a CT scan that showed consolidation of lungs, bilateral pleural effusion, and minimal pneumothorax on the right side. Antibiotics for pneumonia were started as per sputum culture sensitivity and wound infection was managed with daily dressings and antibiotics as per wound-pus culture sensitivity. Pigtail catheter insertion in the right thoracic cavity was done for pleural effusion on the postoperative day 8 which was later removed on the postoperative day 10. The patient tolerated the treatment well, was mobilizing, wound was healing well, and was discharged on the postoperative day 15. She underwent daily dressings of the wound and stoma care on an outpatient basis. Reversal of the stoma was done 3 months later. An ileo-ascending anastomosis was chosen as the mode of operation due to the proximity of the stoma site to the ileum. The patient is now comfortable and leading a normal life with performance of daily routine activities. Ileal perforation peritonitis is a frequently encountered surgical emergency in the developing countries. However, spontaneous ileal perforation is mostly documented as being due to typhoid disease, while tuberculosis and nonspecific enteritis follow close suit. The etiology of perforation in tropical countries continues to be different from its Western counterparts. In contrast to Western countries where lower GI tract perforations predominate, upper GI tract perforations attribute to the majority of cases in India. Spontaneous ileal perforation remains a dreaded surgical condition in developing countries. Typhoid fever remains the predominant cause of nontraumatic ileal perforation, while other causes include tuberculosis, nonspecific inflammation, obstruction, radiation enteritis, and Crohn's disease. Despite the availability of modern diagnostic facilities and advances in treatment regimen, this condition is still associated with high mortality and unavoidable morbidity. Every patient diagnosed is universally recommended to be treated surgically. The purpose of operative protocol is to correct the pathology while avoiding any serious accidents and to adopt a surgical procedure, which is associated with minimal complications. Iron tablets, in case of toxicities, are notorious for causing erosions of the gastric mucosa due to their corrosive effect leading to perforations. The incidence of these, however, is few and far between. Emphasis must be given to the purging of the tablets as soon as possible. If surgery should become necessary, due to infarctions or perforations, it is advisable to irrigate both the peritoneal cavity and the lumen of the small bowel so as to remove as much iron as possible, thus reducing the chances of further complications. However, iron tablets causing erosions as a cause of ileal perforation is virtually unheard of. Literature suggests the possible perforations due to iron toxicity to be in the upper GI tract, namely stomach and duodenum, reflecting the sites of absorption. 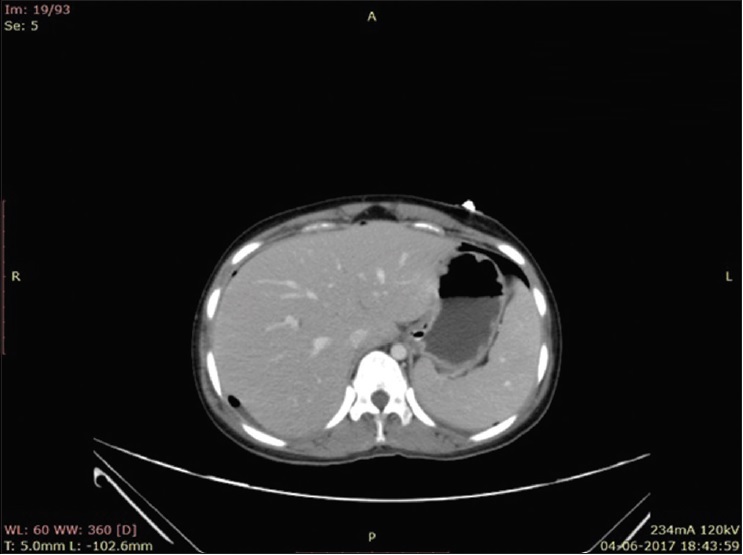 In this case report, the patient presented with an ileal perforation following acute ingestion of iron tablets. A case of ileal perforation can only mean that the absorption did not take place in the upper GI region as proposed. We suspect that this is probably either due to the sheer number of tablets, leading to a reduced absorption, or the fact that it may be enteric coated, which may explain the passage through the upper GI tract undigested. There are no studies to the authors' knowledge that explain such a finding. Thus, there is no consensus on the total amount of iron needed or the minimum time exposed to the toxic agent to produce such a finding. Although clinically and statistically significant ileal perforations due to acute iron tablet ingestion are uncommon, it is a potential life-threatening complication and must be kept in mind by every physician. Care must be taken while prescribing these tablets to educate the patient on their potential harmful effects. Though perforations are not a diagnostic challenge, keeping in mind the potential causes of spontaneous perforations, however rare, and the potential sites where we might find these perforations will save precious time and can help in drastically reducing the morbidity and mortality of this dreaded disease in the long run. Huttunen R, Kairaluoma MI, Mokka RE, Larmi TK. Nontraumatic perforations of the small intestine. Surgery 1977;81:184-8. Farooki MA. 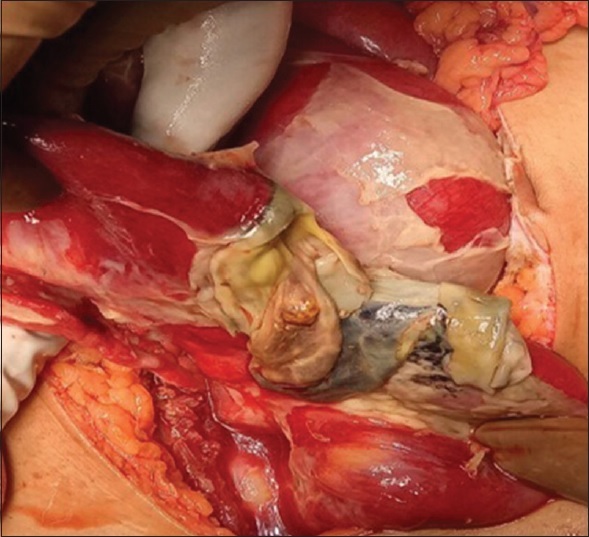 Spontaneous perforation and rupture of the abdominal viscera. Int Surg 1972;57:957-60. Nadkarni KM, Shetty SD, Kagzi RS, Pinto AC, Bhalerao RA. Small-bowel perforations. A study of 32 cases. Arch Surg 1981;116:53-7. Badejo OA, Arigbabu AO. Operative treatment of typhoid perforation with peritoneal irrigation: A comparative study. Gut 1980;21:141-5. Asraf SM, Mital RN, Prakash A. Tuberculous bowel perforations. Am J Proctol 1975;26:47-51. Ihekwaba FN. Ascaris lumbricoides and perforation of the ileum: A critical review. Br J Surg 1979;66:132-4. Upfal J. Australian drug guide: The plain language guide to drugs and medicines of all kinds. 8th ed. Carlton, VIC: Black Inc.; 2006. p. 378-9. World Health Organization. WHO Model List of Essential Medicines. 19th List. World Health Organization. April, 2015. McGuigan MA. Acute iron poisoning. Pediatr Ann 1996;25:33-8. Jhobta RS, Attri AK, Kaushik R, Sharma R, Jhobta A. Spectrum of perforation peritonitis in India – Review of 504 consecutive cases. World J Emerg Surg 2006;1:26. 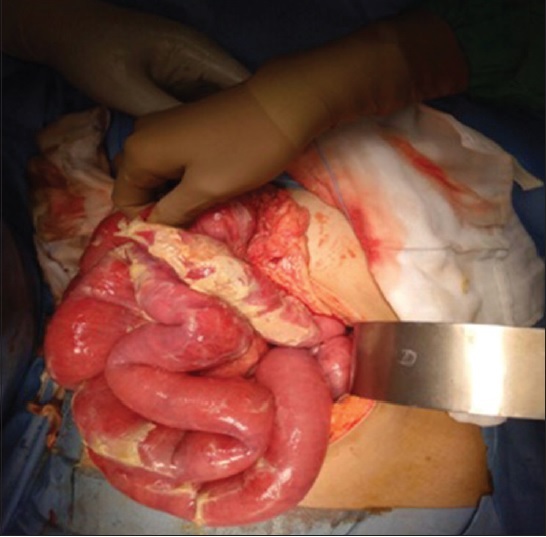 Hussain T, Alam SN, Salim M. Outcome of ileostomy in cases of small bowel perforation. Pak J Surg 2005;21:65-71. Verma H, Pandey S, Sheoran KD, Marwah S. Surgical audit of patients with ileal perforations requiring ileostomy in a tertiary care hospital in India. Surg Res Pract 2015;2015:351548. Rehman A. Spontaneous ileal perforation and experience of 33 cases. J Postgrad Med Instit 2003;17:105-10. Knott LH, Miller RC. Acute iron intoxication with intestinal infarction. J Pediatr Surg 1978;13:720-1.